Whilst snake bites can be poisonous and sometimes even deadly, a snake is far more likely to be scared of you than you are of it so, even if you find yourself in a survival situation where you know snakes could be present, you shouldn’t let your fears blow things out of proportion. You can never truly eliminate the possibility of encountering a snake but there are certain precautions and actions you can take to minimise the risks. Firstly, make sure that you’re wearing boots or strong shoes and long trousers where possible when you’re out walking in terrain where you know or think that there may be snakes. It’s important to make plenty of noise to signal your presence. 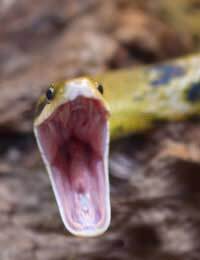 Snakes will usually want to avoid human confrontation at all costs so making a noise will reduce the element of surprise which can cause a snake to attack. Tapping on the ground ahead of you with a stick is usually adequate warning. Snakes like to take advantage of the shade so if possible, try to avoid walking near rocks, logs or similar places where a snake may be seeking cover. Stepping over a fallen tree, for example, is one of the biggest mistakes you can make. Always step onto the tree trunk and make sure a snake isn’t resting on the other side. Also be careful where you place your hands as well as your feet and try to get into the habit of looking down at the ground frequently as you walk along. Although it might seem obvious, you should ensure that you don’t put your hands into any dark crevices until you’ve fully investigated the situation first. Rock crevices and hollow logs, in particular, are perfect resting places for snakes. When preparing your camp in an area which is popular with snakes, make sure that you don’t sleep on the ground unless you have a tent with a groundsheet securely sewn-in. Either erect a hammock or some other kind of platform if possible. If you do need to sleep on the ground, tucking mosquito netting underneath and around the sleeping bag is an effective barrier to an inquisitive snake. Wherever you choose to sleep, make sure you situate yourself way from boulders, trees or tall grass or brush as these are all perfect hiding places for snakes so it’s safer if you’re in a clearing away from these types of features. Also make sure that you take a torch with you at all times if you’re walking about at night. Another important thing to remember if you have killed a snake to eat is not to handle it until you have severed its head. This is because, even after you’ve killed it, its nervous system can still be active when even a dead snake can deliver a deadly bite. Also, make sure you bury the head afterwards or dispose of it safely so that others following don’t fall victim either. Most of the ways you’ll have seen snake bites treated in films or on TV are closer to myth than reality. The most important thing to remember if you or someone you’re travelling with is bitten by a snake is to immobilise the affected limb so that the venom cannot spread around the lymphatic system to other areas of the body. Applying a pressure bandage to the bite (but never a tourniquet which could result in the loss of the limb), you should try to keep the victim calm and reassure them that things will be OK whilst keeping the affected limb at or below the level of the heart. Providing the victim does not fall prey to other conditions such as shock, the next stage is to try to get them to a hospital or clinic as quickly as possible. If you’re regularly out and about in locations which have a large snake population, it’s well worth familiarising yourself about the different species. This can help to save time when doctors are trying to administer the right kind of snake anti-venom if you’ve been able to identify it. Snake bites are, fortunately, rarer than you might think and most bites are not life threatening as long as medical help is obtained quickly. The important thing is to learn as much about the species that may be living in areas you are travelling to so that you can best avoid encountering them in the first place.